At Galileo's core is our proprietary virtual-analog technology that generates tonewheel (and transistor) signals in realtime. You can select among 11 organ types, each of which faithfully replicates the tonal quirks of its physical forebears. Aural artifacts such as harmonic leakage, waveshape and frequency response have all been carefully studied and recreated in this new DSP context. Keyclick, leakage, filter cap values and the general condition of a particular organ would all come together to define that instrument. Galileo carefully replicates all these aspects of the organ to "bring it to life". Such parameters as keyclick volume, drawbar & tonewheel leakage, brilliance as well as attack/release times are fully configurable. 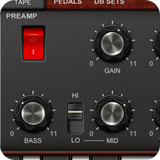 In addition, Galileo features an emulation of the Scanner Vibrato/Chorus circuit found in the '50s & '60s organs. 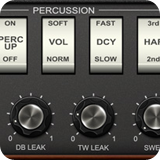 The classic Percussion section completes the package, bolstered with a choice between a traditional or an always-on percussion trigger algorithm. To further embellish Galileo's tone, we designed a harmonic-rich virtual-tube preamp module. Our tube emulation draws heavily from the "Class A" topology, and features desirable characteristics such as asymmetric clipping and input-level sensitivity. With its Gain & Blend controls, it is possible to obtain anything from a mild, transparent tube saturation to full-on 1970s-80s overdrive. The attached tone stack allows you to boost or cut the lows, mids and highs. 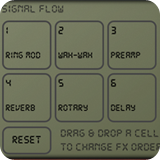 The mid-focus switch changes the preamp's response curve from an "American" to a "British" configuration. We invested a lot of time into analyzing old rotary cabinets and designing a solid DSP equivalent. 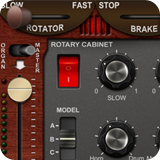 Galileo's rotary effect comes with three unique cabinet voicings: Model A with its bell-like response, B as an "open" cabinet, and C for a more midrange-y baffled growl, all with dedicated emulators for the horn & the drum. Speed & Brake toggles provide realistic control of the speaker "rotors". You can specify the speed for the slow & fast modes, adjust rotor acceleration to change how the speakers speed up/slow down. The drum-to-horn balance and the stereo mic separation parameters also help you conveniently vary the nature of the output. 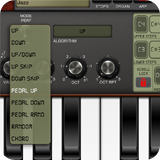 Galileo comes with extensive CoreMIDI & Virtual MIDI capabilities. With a dedicated IO port for each manual, as well as configurable keyboard splitting, you can easily control Galileo with your favorite MIDI keyboard, app/software or even via a MIDI Network session. The MIDI Learn has over 130 destinations, and one-touch access for mapping common expression CCs. The CC maps can easily be saved to file for future use. Galileo includes all the cutting edge technologies and APIs in today's mobile music world. 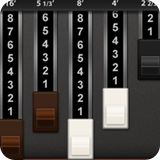 Audiobus integration allows you to route Galileo's output to other apps, and even lets you use Galileo as an FX processor on other apps or physical sourced input. 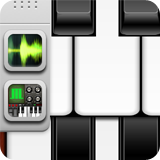 Other technologies include Korg's WIST, Intua & Sonoma copy/paste, Soundcloud sharing, audio backgrounding, Virtual MIDI, WiFi access to audio recordings, iTunes file sharing, and hassle-free preset/bank import & export. 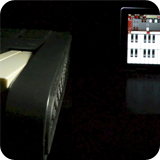 Just some of the other features that round out Galileo: a fully-featured arpeggiator with dedicated note buffers for each manual, a built-in tapedeck with loop-friendly recording preferences, metronome with tap-tempo, dedicated pre-FX and post-FX volume controls, MIDI-note selectable Drawbar Sets, Scale Keyboard with over 50 musical scales, touch velocity sensing, and settable hardware buffer size. 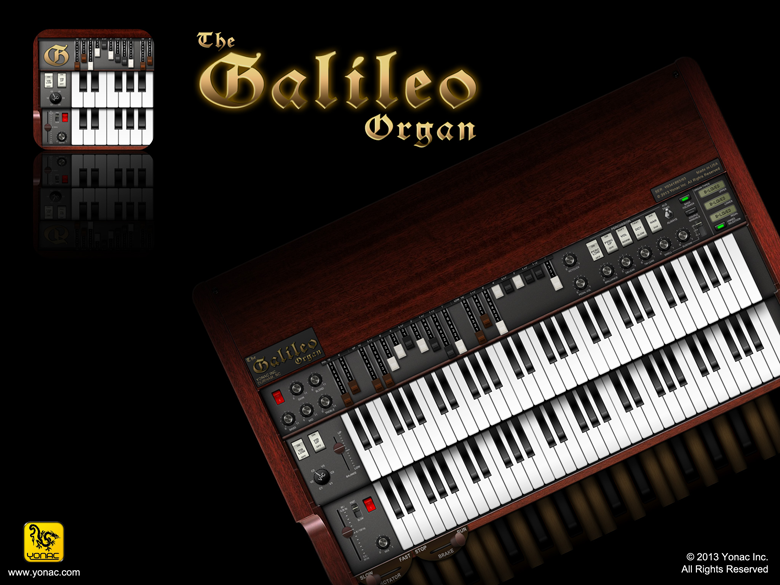 Galileo comes from the factory with over 240 presets, ranging from classic Jazz tones, to Gospel, to Rock and Beyond. It also includes a bank of patches produced by Sunsine Audio. 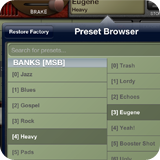 You can conveniently create, save and share limitless banks and presets of your, one-touch favorite any preset or search the banks for a particular preset.